No group of dividend-paying stocks has been more profitably shorted the past few years than high yield telecoms. Short sellers make their money when stock prices fall. And sector companies have not only cut dividends eight times since 2009, but we’ve seen a pair of bankruptcies as well. Not surprisingly, many investors are betting disaster will continue to strike, and short volume against high yield telecom remains near record highs. Savvier players, however, are taking bets elsewhere for three major reasons. 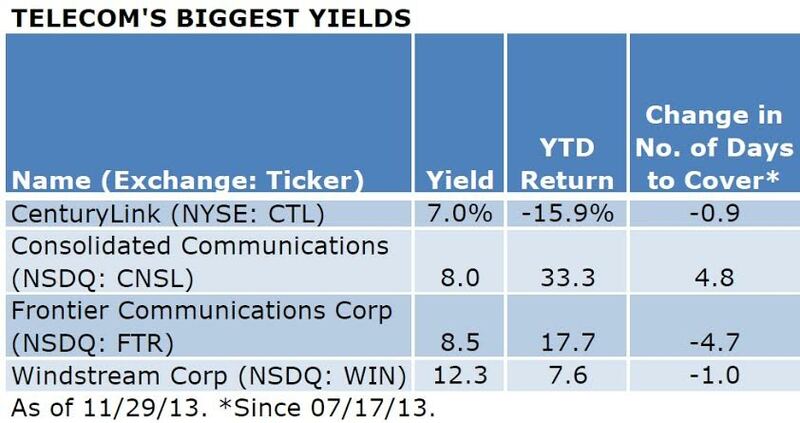 Reason #1: High-yield telecoms’ operating results have improved throughout 2013, and are shaping up to be even better in 2014. Companies’ progress has tracked the management guidance underpinning their high dividends, and repeatedly beaten investor expectations. Sustaining dividends is the key to wireline telecoms’ stock prices. And the key metric for dividend safety is free cash flow. That’s operating cash flow less all capital spending, taxes and debt interest—or essentially what’s left over to pay dividends and service debt. The four companies in my table generated enough free cash flow in the third quarter of 2013 to cover dividends by a 1.9-to-1 margin. That followed a 1.6-to-1 margin in the second quarter. And while forecasts should always be taken with a large grain of salt, all four forecast similarly strong coverage in the fourth quarter, and improving ratios in 2014 as well. Sweet yields can bring sour consequences. And the super high percentages these stocks offer demonstrates a great deal of investor skepticism that their yields can be sustained. These results, however, clearly show these companies have the wherewithal to keep paying at these rates. In fact, revenue trends indicate they’ll be able to for years to come. The basic copper connections linking America for the past century plus are increasingly obsolete. The rap on wireline telecoms is their business will evaporate as consumers and businesses leave them for broadband and wireless networks. And in fact, shrinking revenue combined with hefty debt is the primary reason for the sector dividend cuts of recent years. Consistent high free cash flow, however, is bringing down debt, even as sector companies use low interest rates to term out existing obligations and cut costs. Meanwhile, these four companies have been hard at work converting themselves from traditional service providers into broadband service companies. Both Consolidated Communications (NSDQ: CNSL) and Windstream Corp (NYSE: WIN) now draw less than 20 percent of revenue from the traditional phone business. And as declining line loss rates attest, those operations may be nearing some sort of stasis, as remaining users resist cutting the cord. Consolidated’s revenue actually grew 0.4 percent in the first nine months of 2013 and margins improved as well. The other three companies may take longer to realize revenue growth. But they’re a lot closer now than a year ago. CenturyLink (NYSE: CTL) revenue, for example, shrank 1.1 percent in the third quarter from year earlier levels. That’s a substantial improvement from the 1.7 percent decline rate of the second quarter. And it’s directly attributable to the growth of broadband operations versus the shrinking traditional business. Reason #2: Wireline communications bandwidth is increasingly valuable as wireless spectrum is stretched. The emerging bidding war for Time Warner Cable (NYSE: TWC) is just the latest step toward consolidation in the capital-intensive broadband communications business. And with the stock up better than 40 percent since takeover speculation began last summer, it’s clear just how valuable wireline broadband assets are becoming. These firms simply the need to augment the capabilities of wireless networks. The key reason Verizon Communications (NYSE: VZ) is buying out partner Vodafone Plc (London: VOD, NYSE: VOD) is to better link Verizon Wireless with its FIOS fiber-to-the-home network. Consolidated and Windstream are rapidly building fiber optic cable connections to cellular phone towers for the same reason. As of now, this is a fairly minor source of revenue for both companies. But as the trend of integrating landline networks to expand wireless potential grows, so will the value of these and other assets. That could eventually make all of these companies merger candidates, either among themselves or for the industry’s spectrum-hungry giants. Either way, it promises a lift to these stocks, whose value has to now been reckoned solely by dividend yields. Reason #3: The greater the short volume, the greater the risk to short sellers. Just as rising stocks attract buyers, so falling stocks draw short sellers. The irony is, both groups are buying into trends that are already established and therefore may be close to reversing. As the table shows, those on the short side of these four stocks have been losing money this year, in addition to having to make good on generous dividends. That’s particularly true of short sellers who’ve come on since Valentine’s Day, when CenturyLink cut its dividend by roughly 25 percent and suffered an equivalent one-day drop. Short volume has come down slightly for these stocks since mid-summer. That’s demonstrated by the slight declines in “days to cover,” which is total short volume divided by average daily trading volume. Overall, however, it would take 11.7 average trading days to cover total short positions on these stocks. And short interest is also about 12 percent of total shares traded. That’s a lot of positions to close out, should any of these companies surprise to the upside. And when short sellers exit, they have to buy shares, which pushes stock prices higher and heightens the pain on remaining short positions. This is the essence of a short squeeze. We may already be seeing one in the works for Consolidated Communications, which is up nearly 16 percent since the beginning of September and has returned better than 33 percent already in 2013. The wild action this year in Frontier Communications (short interest 20 percent of float) means it could be an even bigger loser for the shorts—should future results show broadband revenue growth overtaking traditional phone business decline. That possibility was broached by a J.P. Morgan report earlier this month. Morgan is officially “neutral” on Frontier with a target price of $5. So are seven other Wall Street houses. Eight, meanwhile, rate the stock “buy” with varied degrees of enthusiasm, while two consider it a sell. The current count represents only a slightly bullish shift over the past couple years. But it does coincide with an equally subtle boost in Frontier’s general trading range. A real move by Frontier toward revenue growth will almost certainly shift Morgan and other neutral-to-negative research houses more positive. And with so much short volume as tender, the resulting conflagration could indeed set off an historic short squeeze—pushing Frontier stock sharply and rapidly higher. To be sure, Frontier has work to do before revenue growth does turn positive for good. So do the other high-yield telecoms in my table, with the exception of Consolidated. That’s why I’m observing tight buy targets on all of them in Conrad’s Utility Investor. The good news is, expectations are low and therefore easy to beat. And in the meantime, these results indicate companies’ dividends are better funded than they’ve been in some time. That’s good news indeed for those of you who still hold stocks in this group, as I do.